A Great Eat Without The Meat! 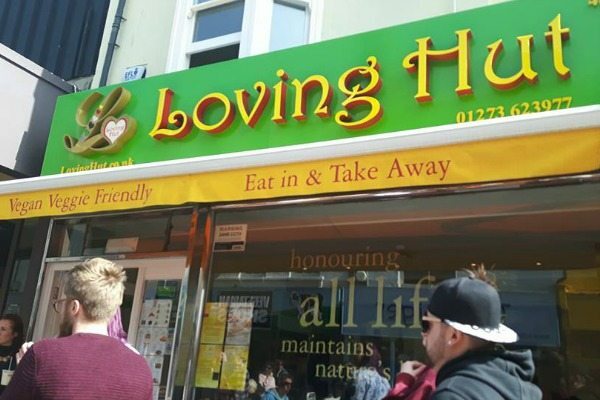 Loving Hut can be found tucked in Gardner street, one of the famous North Laine. 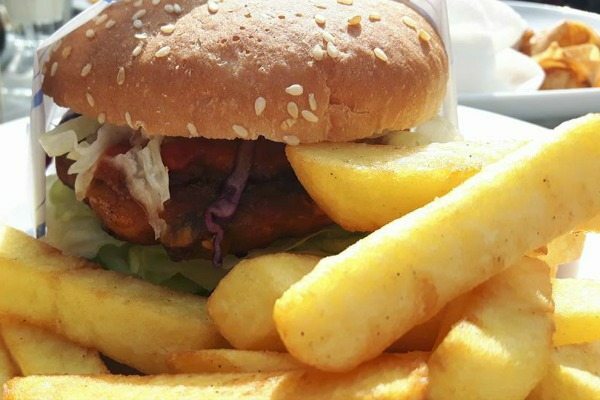 It is a purely vegan global chain whose vision is to provide ethical food at affordable prices. 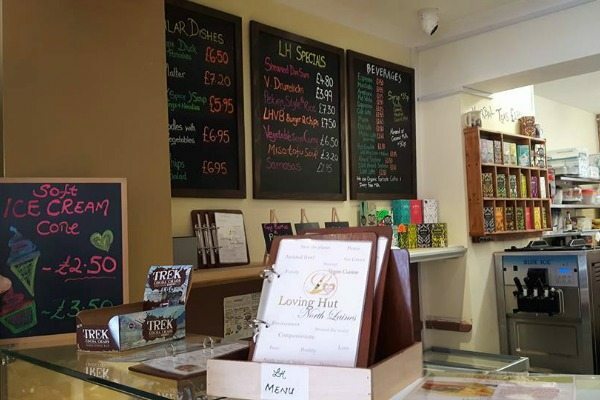 While many vegan and vegetarian restaurants seek to present a vegetable-focused alternative to animal products, Loving Hut is one which imitates traditionally meat-oriented dishes. And it does this very successfully. As it was a sunny day when we visited the cafe we sat at a table out the front and watched the busy Saturday crowd go by. 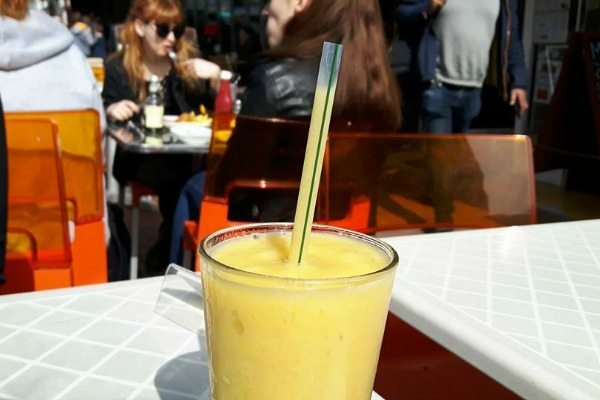 To drink my friend went for a vanilla milkshake made with coconut milk, and I had a mango and banana smoothie. Where do I start with that milkshake? 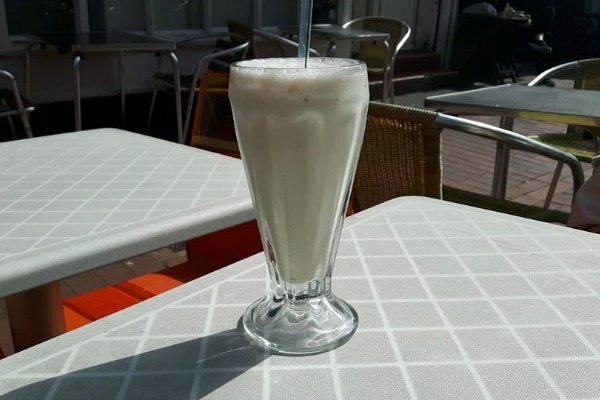 It was exquisitely sweet and creamy and just blew all other milkshakes out of the water. Did I mention this was a vegan milkshake? The smoothie was also delicious, you could taste the thickness and pure raw fibre of the fruit. It was very chilled, which was refreshing in the heat. To start we went for the Chinese platter. 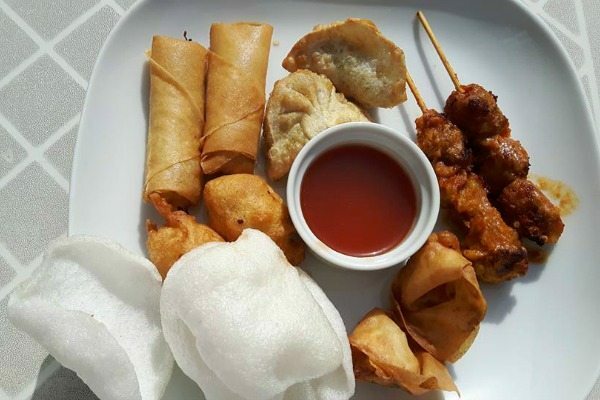 This consists of a pleasingly-presented selection of satay skewers, crispy wontons, sweet and sour balls, crispy dumplings, crispy clouds and spring rolls. The skewers were remarkably meaty and succulent – so much so that I wondered whether it was chicken (of course, it wasn’t). The chicken balls had that comforting, almost gooey, batter texture. 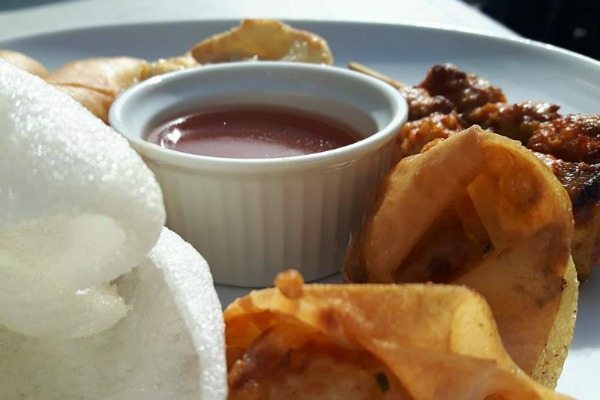 The prawn crackers unfortunately lacked a strong flavour, but everything else on the platter was executed well. For the main course I opted for the intriguing jumbo not-dog and my friend chose the spicy bean burger. The not-dog is obviously a vegan take on the hotdog but, again, I couldn’t tell it was vegan. 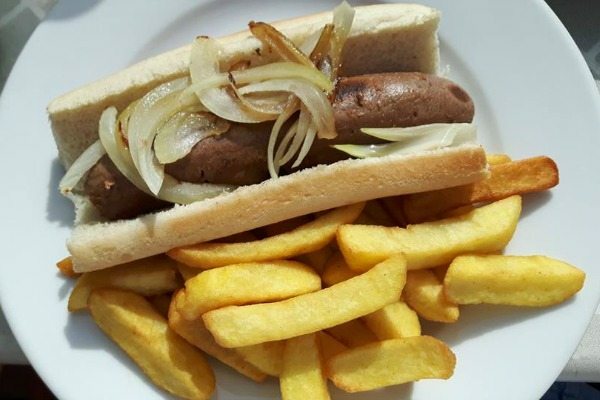 To me, it tasted just like a bratwurst. It comes with chips and garnished with onions. As for the spicy bean burger, sadly it was not particularly spicy, and needed more seasoning. The coleslaw that came with the burger also didn’t have a strong flavour to add to the mix. My friend said it was a dish she would not order again. Additionally she had ordered sweet potato fries and only regular chips came, but the cafe was very busy so this minor hiccup was understandable. For dessert we rallied ourselves after two big portions and ordered the irresistible-looking salted caramel brownie and a seductive blueberry cheesecake. It is a testament to how tempting Loving Hut’s desserts are that my friend couldn’t resist taking a bite before I had a chance to take a photo. 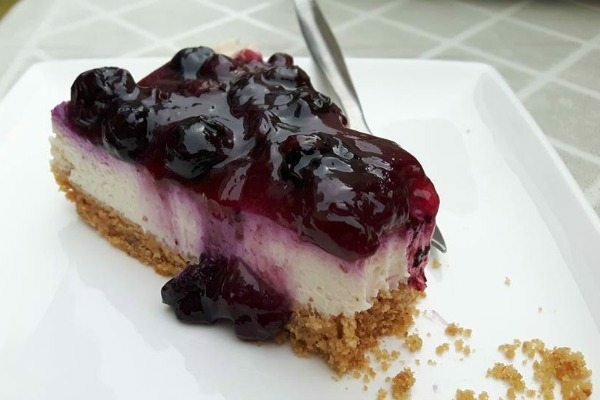 The blueberry cheesecake was moist, creamy and sumptuous. 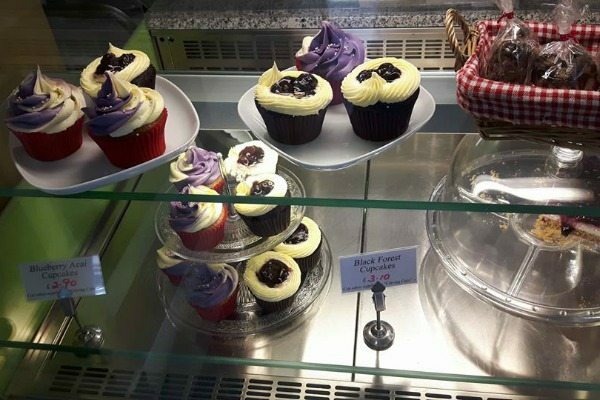 The tartness of the blueberry topping contrasted satisfyingly with the velvety smoothness of the body of the cake. The salted caramel brownie was served with raspberry ice cream. My friend and I both tried it and agreed it was different to any other dessert we had had before. As all good brownies should be, it was gooey, but its texture hit that perfect combination of stickiness and smoothness which is rarely achieved. The salted caramel woven into the chocolate made for an exquisitely vibrant flavour. As for the raspberry ice cream, it was sharp and sweet – you can really taste the fruit. Sometimes, as someone who has given up meat, the food you really miss is the unglamorous but satisfying taste of a burger or hotdog. It is wonderful to know that this craving can be met without actual meat. 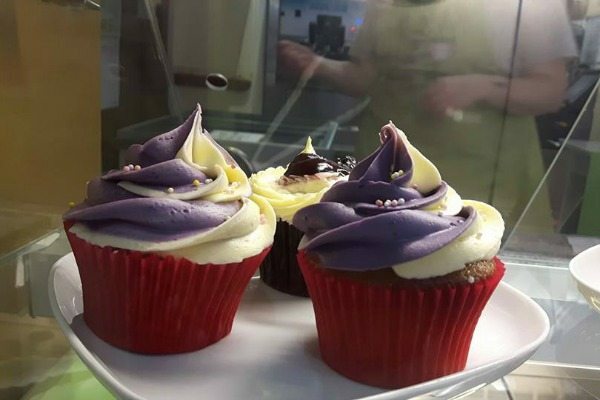 And, in many cases, this cafe has demonstrated that food can even be better without animal products. Loving Hut presents a strong argument for a mainstream vegan diet.